In honor of Earth Day, Tesla is partnering with luxury vacation company Jetsetter to offer thoroughly green luxury weekend getaways. Vacationers are invited to stay for a full weekend at one of three top-tier, eco-friendly hotels in North America: The Loden in Vancouver, The Cosmopolitan in Las Vegas, or the Bardessono in Napa Valley. During their stay, they will get total access to an electric Tesla Roadster for two days. This is the first time Tesla has offered an opportunity like this! 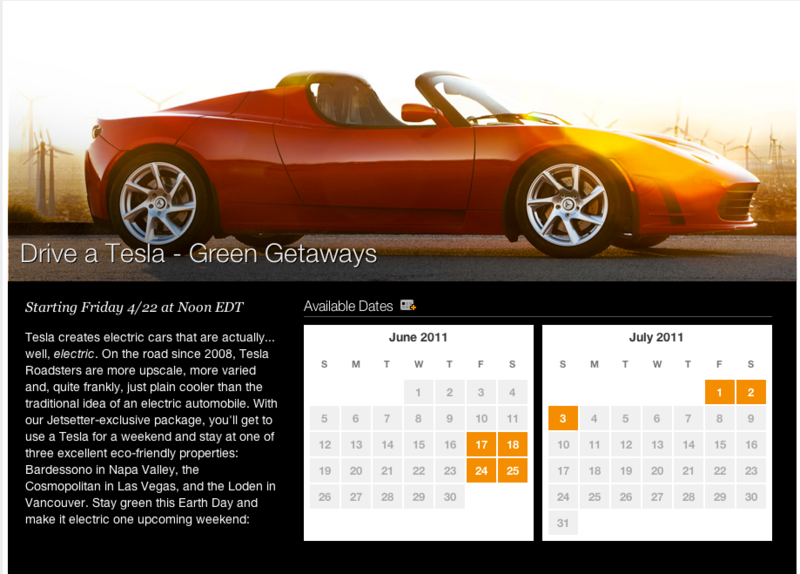 The weekend packages go on sale at noon EDT today, Earth Day, Friday, April 22 at http://www.jetsetter.com/tesla. Jetsetter operates very similarly to Gilt Groupe. It’s an online community that provides members with insider access, expert knowledge and exclusive deals on the world’s greatest vacations. Sales are valid for a limited time only, and are first come first serve. Those who sign up with Jetsetter to take advantage of the Tesla deal will receive a $50 credit.